Hey all, the fishing on the big pond continues to be totally awesome and really frustrating at the same time. 2 of us fished Sat morning and we caught 18, none for the livewell, they were all over the slot. So we tried again this morning, 8 more, one 13.5" we could keep, arrgg!!!! 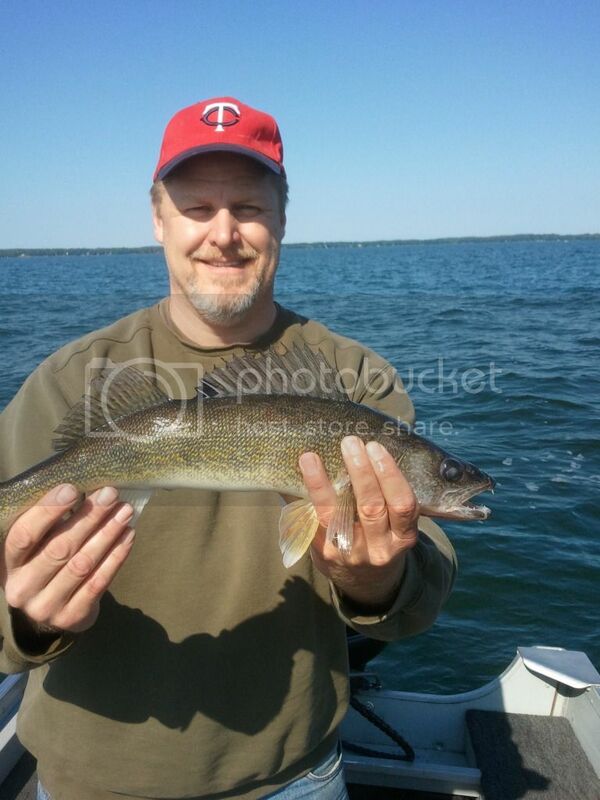 In 2 mornings we caught maybe 125lbs of walleyes and will be able to eat a single one pounder!!!!!! We worked the flats on the west side. Using leeches, 6' snells, red hooks. The fish were holding pretty close to the edges, tops and bottoms were holding the most active fish. Seemed as though everyone out there was doing as well as we were or as bad depending on how you look at it. Most fish were between 24" and 28" with a few better than that...enjoy the pic's! Heck that sure is a nice "catch" total! nothing to be ashamed of! May I add these to the pics pages? Go ahead Webdude. They are all yours...not bad for phone pic's...maybe you could resize them a bit as well? Looks like you guys had fun! Great pics. Those fish revive nice this time of year at least, versus later in the summer. Thanks everyone, and you as well Webdude. It's a rare day that I head out fishing for a day of catch and release. I like to go fishing to catch fish and eat fish. This is usually why I don't specifically target Bass and Muskie. Because they are C&R species for me. 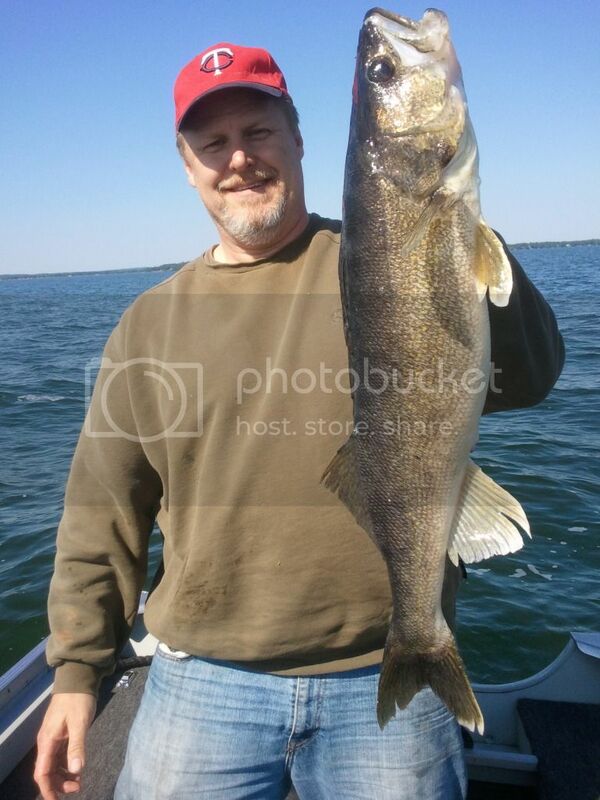 So when I go walleye fishing, my plan is to bring home a few for dinner. If I catch a big one, a pic is good, let it go, and catch some more dinner. Don't get me wrong, we had a blast hammering the eye's the other day! But the frustrating part starts when fish like the one I'm posting this time are still too big to keep! And knowing that all the big ones that I keep catching are not going to survive! The hooked mortality rate on these big fish has to be fairly high. How is the fishery benefiting by catching and releasing so many big fish, thus killing a fairly significant percentage of them, to finally catch a one pound 13.5 inch fish to bring home. I'm sure that a few of those 5-10+lb fish died after release. 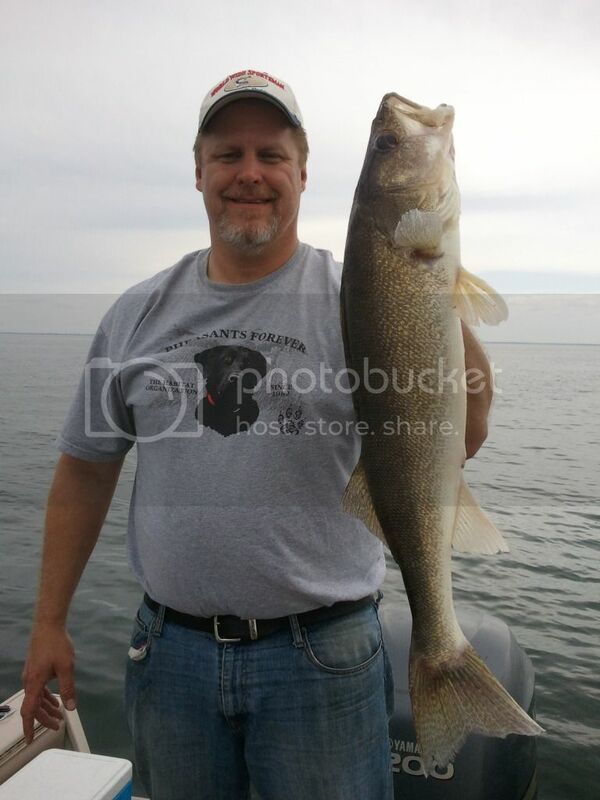 So we killed 15-30lbs of walleyes to bring home one lb of walleye. And there were 1000's boats on the lake over the weekend doing the same thing! It seemed as though everyone was doing as well as us, and we talked to a fair number of other boats on the water and at the launch. The biomass of fish swimming in the lake has gotten to be so disproportionately large it seems almost like a waste of time going there to find dinner. I think the fishery would be better off if the limit were 3 a piece, slot reduced to 20-28. This way, people would be able to go home faster, and kill a lot less fish in the long run while trying to catch dinner. I'm sure with the huge number of 20-28" fish in the lake that they will be able to lay plenty of eggs next year for a successful spawn. Your thoughts please!!!! This fish was 17.75" and had to be released! I have to ask if that was the fact wouldnt there be 25" plus fish floating everywhere on the lake and shore? The last time that happened every news station was up there. The problem I see with your proposed slot is that not everyone is going out to bring fish home, they go out just to catch fish. I do see were you are going with this and have also spent countless hours I will never get back trying to think of a good solution. Yep still thinking. The closest I came to was you keep the first 3 fish you catch and your done. Yes there is all kinds of things wrong with that also but it answers alot also. I understand not all people fish the way I do. Some are trophy hunters, some doing the tournies, you got launches, and guides looking to keep clients happy. But I would guess the vast majority out there are looking for a limit, or enough for a meal, and head in or go home. But the real problem is the over supply of real big fish. I believe the problem just continues to get worse over time with the slot always being the same. In my opinion the lake has clearly been over harvested of smaller fish. The real question is how to restore the lake to a more natural balance. I'm not a biologist, but I do have some common sense, and plenty of garage logic. I don't see this situation as a healthy option for the lake in the long run. And that's all I really care about, a longterm healthy fish population. A few years back we had a baitfish collapse...and fishing was so easy because of starving skinny fish that didn't even have a enough energy to fight. I didn't even fish the lake that year after what I saw. The main theory on the collapse at the time was an oversupply of big fish...are we headed there again? I didn't see any baitfish at all on the graphs! So who knows? I never did hear any solid answers explaining the collapse later either. I'm sure they could only guess as well. I know this much though, things are out of whack right now, big fish like this should be the exception, or relatively uncommon, not the only thing that you can catch! And yes, there are floaters out there. Not a lot yet, but you can see them around, and with the water heating up fast, the problem will only get worse. 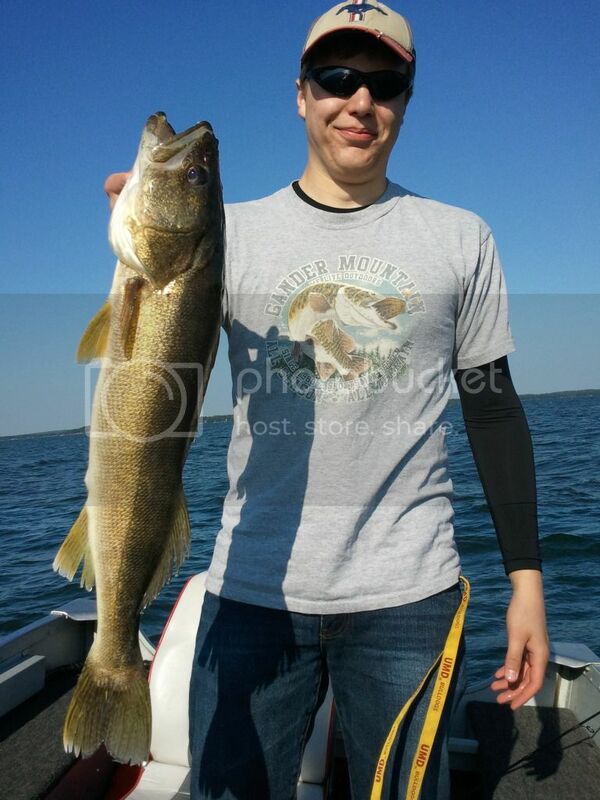 I'm probably the rarity here, but I have never caught one fish on Mille Lacs. Not one. Because of that I usually go once a season, have a nice day and go home empty handed. I do, however, like to read and am a news junky. Expecially when it comes to fishing. From everything I've read it seems that the root cause of most of the Mille Lacs' problems is the treaty. The treaty has the DNR between a rock and a hard place. To keep the Walleye population optimum the DNR & the band decide want the total limit should be. This limit is divied up between the band and the rest of the state. There are far more people in the rest of the state than in the band. To band goes out and does its harvest. The rest of the state has its season. The businesses and the resort owners want as many other people to come to Mille Lacs to catch fish. Good for business. The DNR want people to fish also. Good for tax gathering. However, DNR has the burden of making sure that the total harvest doesn't go over the limit. The only way to do that is to keep the total pounds per fisher-person as low as possible to keep the the season open for as long as possible. You can talk all you want about the biological reasons behind the slot sizes, but even to the untrained person it seems rediculous to harvest all the young fish allowing the older, larger fish to fight for food and eventually die off of old age. I've looked at this for years and as much I as have tried to come up with another compelling reason for things being the way they are this is the only answer that makes sense. Trouble is, my answer is not politically correct. Probably won't make any friends with my observation, but there it is.